Two storey home on a huge flat lot in a quiet cul-de-sac. 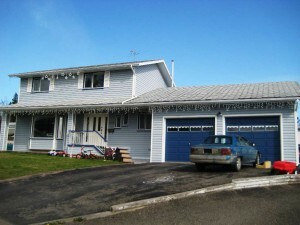 This 2 storey home features 4 bedrooms on the 2nd level with 4 piece bathroom & 2 piece ensuite. The main floor features a large kitchen with adjoining family room, living room & formal dining room. The kitchen & family room lead to the back patio & yard. There is a 3 piece bathroom on the main floor. The basement features a huge area that is partially finished & is perfect for a children’s play room. There is a 2 car garage & room for an RV or boat. The yard is partially fenced. Min 24 hours notice for showings.